A gastronomy enthusiast, Tara shares her recipe of Guava Jelly. 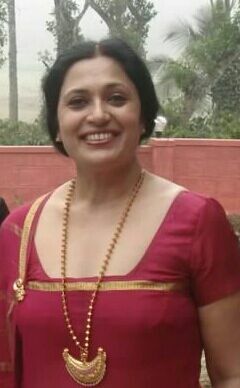 She points out that guavas are available throughout the year in Coorg. 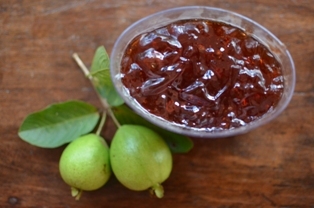 A delicious jelly can be made using the juice collected after boiling semi-ripe guavas. The jelly is transparent and has a pale reddish brown colour. It needs no added preservatives. Put the diced guavas in a deep pan or in a pressure cooker, with enough water to just cover the fruit. (If using the pressure cooker, reduce the water slightly.) Cook till the fruit is soft. Do not stir and make sure not to overcook till it becomes a paste. Using a clean, thin cloth, strain the fruit pulp and allow the clear liquid to collect. Measure the strained liquid. Add one cup of sugar to every cup of liquid. Put it back on thefire,add lemon juice to the mixture. Boil until the juice is sticky. You may notice white froth on the edge of the vessel when the right consistency is reached. Stir well. Note : To check if the jelly consistency is reached take a small bowl, add some water and drop a spoonful of the mixture. If the mixture does not spread and retains a jelly consistency then your guava jelly is ready. In case after cooling the jelly hasn’t set, boil the mixture again till the right consistently is reached. Have clean glass bottles ready, and keep them warm, so that when the hot jelly is poured into the bottle, they do not crack. Pour the hot jelly into the bottles, let them cool, and store. The jelly can be refrigerated for later use. Guava jelly can be eaten with bread,dosa, rotis and also used as a dessert.